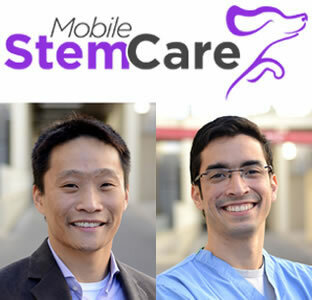 UTSA graduate biomedical engineering students Tony Yuan and Ramon Coronado launch Mobile Stem Care. (April 1, 2014) -- Two University of Texas at San Antonio (UTSA) biomedical engineering doctoral students, Ramon Coronado and Tony Yuan, have launched Mobile Stem Care LLC, a company that will help veterinarians treat their patients with the latest advancements in stem cell therapies. The first of its kind in Texas, Mobile Stem Care is a mobile service that offers adipose stem cell and platelet rich plasma (PRP) isolation to veterinarians for treatments in dogs, cats and other animals suffering from degenerative diseases such as osteoarthritis or hip dysplasia, ligament and tendon injuries or non-healing wounds. Mobile Stem Care takes adipose tissue (fat) collected from the affected animal by the veterinary doctor and isolates the adult stem cells on-site in less than 90 minutes. A concentration of the animal's stem cells and other immune-regulatory cells are returned to the doctor and injected into the damaged area of the animal to stimulate growth of healthy cells and aid healing. Steven A. Davis, M.D., founder and director of the Dermatology and Laser Center of San Antonio, clinical professor at the UT Health Science Center San Antonio and co-founder of privately held StemBioSys Inc., is an investor in Mobile Stem Care. "The first thing you invest in is people, and I'm very confident in Tony and Ramon. They are energetic, bright and they have proven themselves in a degree program with a lot of credibility," said Davis. "The stem cell arena is exciting from both a scientific and commercial standpoint. Mobile Stem Care is a unique idea and its services have value in the biomedical sphere. I think it can be successful." Coronado and Yuan began the Ph.D. program in biomedical engineering in 2011 and became fast friends, sharing a common passion for science, helping others, rock-climbing and now business. Since 2012, they have worked in the laboratories of the U.S. Army Institute of Surgical Research, where they have been exposed to advancements in stem cell research and treatments. The company idea came to fruition in August 2013 when Coronado and Yuan started the Graduate Certificate Program in Technology Entrepreneurship and Management offered through the UTSA College of Business and led by Cory Hallam, UTSA chief commercialization officer and director of the Center for Innovation and Technology Entrepreneurship. The 12-hour certificate is designed to help current UTSA graduate students unlock their inner entrepreneur and equip them with the fundamental skills required to start a technology company. "When we started the first class in the certificate program, we knew nothing about starting or running a business," said Yuan. "Thanks to UTSA, we have been able to pursue our dream of taking this scientific research and bringing it to industry in a way that will directly benefit society." "To my knowledge, there has never been a UTSA biotechnology company that has secured funding and launched their business this quickly," said Hallam. "Mobile Stem Care shows exceptional promise, and it has been exciting for me to watch these young men develop into savvy entrepreneurs in a very short time." Bringing the clinic to the patient and providing the service in 90 minutes sets Mobile Stem Care apart from similar companies that offer stem cell isolation services. It allows the company to avoid shipping delays, which can cause transported stem cells to degenerate or die and lose effectiveness before they ever reach the patient. Additionally, because Mobile Stem Care is a completely portable service, veterinary clinics do not need to purchase equipment, hire staff or factor in overhead costs associated with the stem cell therapy process. Adult stem cell therapy has been available commercially for animals since 2002. 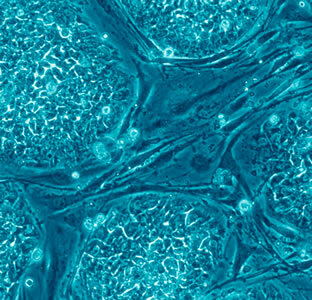 Research on adult stem cells, however, began in the 1950s. Adult stem cells -- which come from animals already born, not from embryos -- offer the possibility of a renewable source of replacement cells and tissues to treat a myriad of diseases, conditions and disabilities. Mobile Stem Care joins the ranks of the many companies and organizations that are helping put San Antonio on the map for stem cell research, tissue engineering and regenerative medicine. Those organizations include UTSA, the UT Health Science Center San Antonio, Southwest Research Institute, Texas Biomedical Research Institute and its Southwest National Primate Research Center, the U.S. Army Institute of Surgical Research, the National Trauma Institute, South Texas Blood and Tissue Center and RegenMed SA. Learn more about the UTSA College of Engineering and the UTSA College of Business.